Hawker is a culinary journey. You are welcome. Hawker 45’s tasting menu is a journey through the memories and tastes of Chef Laila’s life, which wanders hither and yon. From Philippines, Vietnam and Singapore to Japan, Korea or even Brazil, the menu will set you flying. Eyes wide-open, Chef Laila gets inspiration from all kind of dishes, to which she adds her very own signature style. For instance, try the Kinilaw, a typical Filipino dish where she uses tuna, lime, kalamansi, coconut pulp, cream of avocados and tomatoes cherry. Or the Bomba de Pho - a croquette stuffed with calf cheeks cooked at low temperature with lime emulsion, sriracha and accompanied with a delicious Pho broth reduction – a creative play on a traditional Vietnamese dish presented as a “Bomba de Barceloneta”, a signature Barcelona specialty. Chef Laila isn’t afraid to redefine iconic dishes, such as the Japanese salmon Okonomiyaki, accompanied by wakame seasoned with sesame sauce, plum sauce and beni shoga. Or to create iconic dishes herself, as with the Laksa, one of her most celebrated dishes – a sweet rice with shrimp, a reduction of fumet, spices, squid, coconut cream and laksa leaves inspired by the Singapore’s famous curry noodle soup. Also, traditional dishes like Filipino Adobo aren’t left out of the adventurous menu. As you might have already discovered, the menu at Hawker45 is like a map of the world, with exotic ingredients found in every plate. And to cap it all off, there’s no better end than Dirty Ice Cream, the most famous dessert of Filipino street cuisine, with salty caramel and pork rinds. A tasty flight you’ll never want to leave. 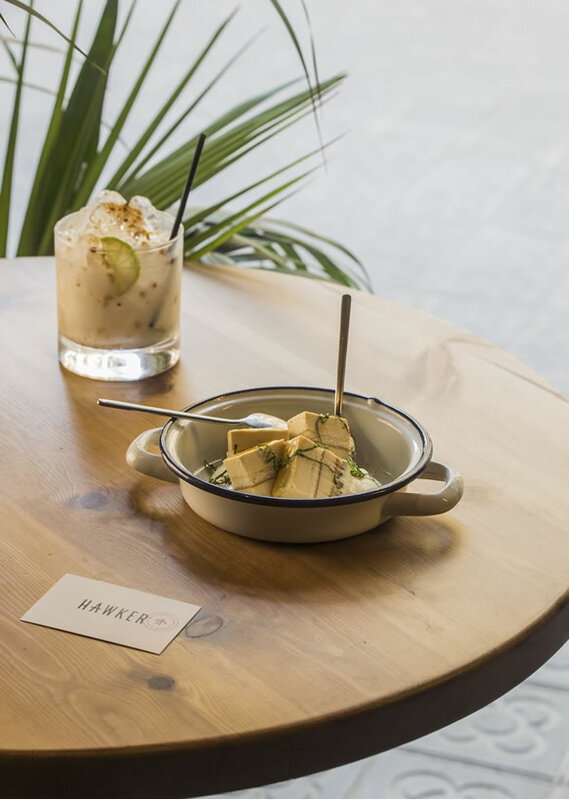 Hawker 45 features a 12€ - 15€ lunch menu that changes every day. Here, we offer a satisfying and economical set menu for our regular lunch clientele which allows us to experiment with different flavors and presentations, all in our signature Hawker 45 style. Drinks take on special importance in Hawker45’s menu. All the flavors marry perfectly with excellent wines, cocktails or coffee. A carefully-selected offering designed exclusively to make your experience at Hawker45 unforgettable. We also offer a selection of traditional and homemade craft sodas. The wine list offers 18 curated references. Created together with sommelier Dani García of “Wine is Social”, the list features offerings from small regional wineries, with some very interesting biodynamic and natural references, all carefully selected to pair with Hawker 45’s signature flavors. Behind each wine there are also interesting stories, which have earned them a place in the menu. The cocktails fit the flavors of Hawker45. 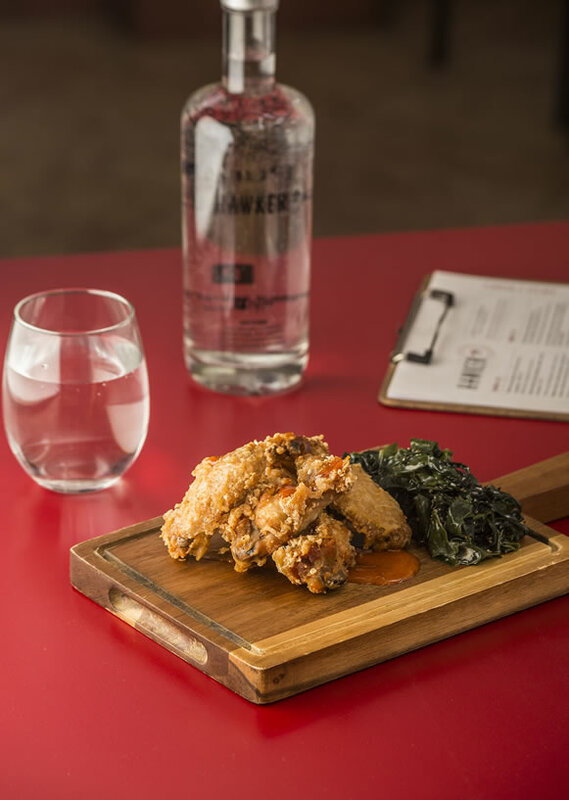 Thus, the ingredients used in the kitchen extend to the cocktail menu that, with our reinterpretation, is influenced by the flavors of southeast Asia. In collaboration with celebrated Spanish bartender Javier Caballero, author of “Liquid Experience”, the cocktails are inspired by classic recipes, but with a twist of exotic ingredients so typical of our menu. The coffee we serve at Hawker45 is signed by Café Tornado. A specialty coffee that in each sip will take you to the small plantations from which its grains are sourced. In short, coffee of excellent quality that you will remember for its flavor, aroma and personality.